Home Biafra Nnamdi Kanu Biafra: [Statues Galore]: Between Nnamdi Kanu Of The Indigenous People Of Biafra And Rochas Okorocha Governor Of Imo State Who Is A Mad Man? Biafra: [Statues Galore]: Between Nnamdi Kanu Of The Indigenous People Of Biafra And Rochas Okorocha Governor Of Imo State Who Is A Mad Man? Critique By: Eke Macdonald Ndubuisi - TBP November 21, 2017 The preoccupation of this brilliant critique essay is to look into the problems of social integration, social solidarity and lack of human development in our society caused by the people in the seat of authority; a sharp contrast will be focused on Rochas Okorocha's ideology and that of Nnamdi Kanu of Indigenous People of Biafra. The structure of a society is differentiated according to the functions performed by the different elements in relation to the goal of that society survival; Rochas Okorocha Governor of Imo State in this piece is nothing but a pure lunatic, a braggart without any concise laid down rules for others to follow nor emulate. Late Dr. Sam Onunaka Mbakwe of the blessed memory was a man who then as the Governor of old Imo State which comprises of today Abia State, he developed the State as a unit; there was laid down rules and principles that helped positioned the then old Imo State as the home for all. Society creates human behaviors and human beings passively respond to the requirements of the society; but what do we see in Owerri the State capital of Imo is nothing but desultorily from the Okorocha's Government. 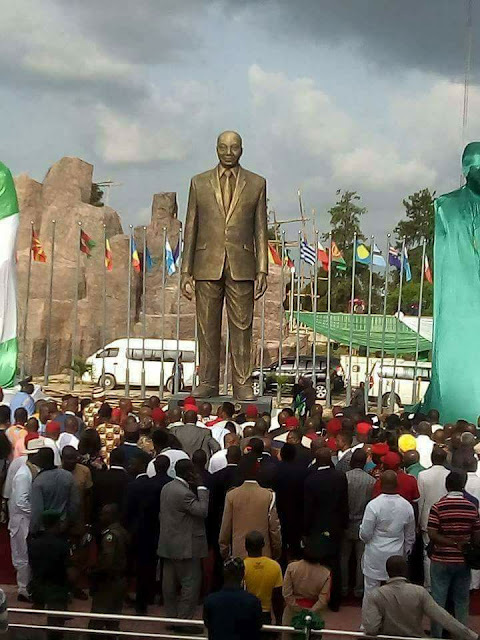 What is the normative desideratum to show that all the people of Imo State wish for and needed is non-viable and inconsequential human statues?. I can recall vividly this megalomania of a conscienceless Governor campaign promises known as his party manifesto, how he promised to re position Imo State in terms of job creation, industries that will make Imo State an economic hub of Eastern region of Nigeria. When and where in the world has erecting of statues help create jobs that will generate income for the teeming suffering masses of Imo State? Rochas Okorocha's mendacious characters are not to be replicated anywhere else unless such a society are made up of back warded individuals. There is an urgent need for social change or revolution in Imo State because I have observed the much tilted in the performance of the functions of the State institutions manned by the Government to the extent that the societal values of the State becomes dysfunctional. Like the earlier phenomenology posited that human beings create society and social reality; first we look at the Imo State - State budget for year 2017. What is the accrued funds in the Imo State treasury before the Paris funds were shared to the various States that benefited? Can the State auditor General and Chief accountant of the State make open to the public how the State owned money is being managed on day to day affairs concerning the development of the State. Also recall that this criminal of a man and Governor of Imo State [Rochas Okorocha] who always exaggerates himself-importance slashed the Imo State pensioners funds to paltry sum of 40% without questioning; Imolites do not want to create nor change their social reality from the present suffering conditions the State Governor had confined them into as corroborated in the findings of the earlier phenomenology like Husserl, Alfred Schultz, Peter Berger and Thomas Luckmann. Like in the course of ethno-methodology; the critic being the investigator of this 'critique' has made a valid contrast between what happened during Rochas Okorocha predecessors' using Late Dr. Sam Onunaka Mbakwe as a yardstick and the sudden interruption, disruption and what happens afterwards that Imo State is nothing to write home about since the man died. I have searched for veracity and classificatory into what the mind deluded Rochas Okorocha is doing, if it is in-line with the Imo State master plan as envisaged by the Imo elites but the answer is null and void. Instead of Rochas Okorocha to be the employee of the Imolites has turned himself to be the employer of the Imolites; rather than he [Rochas Okorocha] dancing to the tunes of the poor masses of his State has turned the poor masses of his State into dancing his own tune and buddings, this corroborated with the works of Karl Marx 1818-1883; Karl Marx could not understand why people are good, honest and believed in social justice yet injustice and poverty prevailed high in the midst of plenty within their society. Karl Marx alleged that people live in 'unnatural competitive or conflict relationship' it is seen here that the governed are viewed as pawns by their ruler. A situation that the ruler creates the dominant group who subjugate and lord themselves over the subordinated group. Karl Marx exemplifies this scenario with the relationship between the worker who is employed and who offers his labour in exchange for wages and his employer who owns the industry and dictates the form of relationship that should exist between them. In this case the employer being Rochas Okorocha as he sees himself; he is no longer the employee of the people has altered the natural state which exists resulting to alienation of ideas by well to do men and women of good conscience, the technocrats, the lettered personalities etc. Rochas Okorocha was quick and desperate to challenge Nnamdi Kanu of the Indigenous People of Biafra and called him a mad man. Nnamdi Kanu ideology is far benefiting to the betterment of his Biafran people over what Rochas Okorocha is doing in Imo State that every day he unveils one statue or another; Nnamdi Kanu is fighting to emancipate his people from neo-slavery in the Nigeria context because of some selfish individuals like the present Governor of Imo State [Rochas Okorocha] who is seriously working to enslave his people economically and politically wise. I recounted the embarrassing story in details told by Mazi Nnamdi Kanu of RadioBiafra that made Rochas Okorocha to squirmed; Nnamdi Kanu exposed him as a criminal who always package and present himself as a saint, Nnamdi Kanu denied him [Rochas Okorocha] the opportunity to join his Indigenous People of Biafra because as a ruthless politician will always shrill and corrupt his freedom movement. Like Nnamdi Kanu; society cannot be analyzed without first understanding and having the complete knowledge of the people in it. The people needs to understand the structure and organization of the basic relationship of its central institutions [Government and pattern of ruler ship], central institutions according to Nnamdi Kanu's philosophy can mean whose ideas are the government deliberating issues on? Nnamdi Kanu sees values, norms and social relationship as that which most directly influences human behavioral tendencies and survival. Between the man that wants accountability and freedom in all spheres of human endeavors and a man who goes around erecting statues who is a mad man?.